SacLatino.com: Five facts on unauthorized immigration in the U.S.
Five facts on unauthorized immigration in the U.S. The number of unauthorized immigrants in the U.S. has stabilized in recent years after decades of rapid growth. But there have been shifts in the states where unauthorized immigrants live and the countries where they were born. Millions could receive relief from deportation and work visas from an executive order that President Obama is expected to announce soon. The action would be the most significant protection from deportation offered to unauthorized immigrants since 1986, when Congress passed a law that allowed 2.7 million unauthorized immigrants to obtain a green card. Here are five facts about the unauthorized immigrant population in the U.S.
1. There were 11.2 million unauthorized immigrants in the U.S. in 2012, a total unchanged from 2009, and currently making up 3.5% of the nation’s population. (Preliminary estimates show the population was 11.3 million in 2013.) 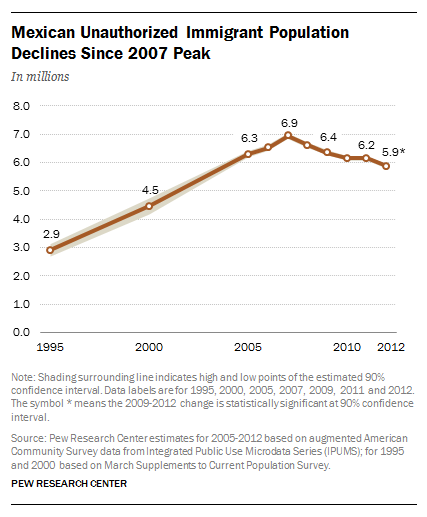 The number of unauthorized immigrants peaked in 2007 at 12.2 million, when this group was 4% of the U.S. population. 2. Mexicans make up about half of all unauthorized immigrants (52%), though their numbers have been declining in recent years. There were 5.9 million Mexican unauthorized immigrants living in the U.S. in 2012, down from 6.4 million in 2009, according to Pew Research Center estimates. Over the same time period, the number of unauthorized immigrants from Asia, the Caribbean, Central America and a grouping of countries in the Middle East, Africa and some other areas grew slightly (unauthorized immigrant populations from South America and Europe/Canada did not change significantly). 3. Six states alone account for 60% of unauthorized immigrants—California, Texas, Florida, New York, New Jersey and Illinois. But the distribution of the population is changing. From 2009 to 2012, several East Coast states were among those with population increases, whereas several Western states were among those with population decreases. There are seven states overall in which the unauthorized immigrant population increased: Florida, Idaho, Maryland, Nebraska, New Jersey, Pennsylvania and Virginia. Meanwhile, there were 14 states in which the population decreased over the same time period: Alabama, Arizona, California, Colorado, Georgia, Illinois, Indiana, Kansas, Kentucky, Massachusetts, Nevada, New Mexico, New York and Oregon. Despite a decline, Nevada has the nation’s largest share (8%) of unauthorized immigrants in its state population.